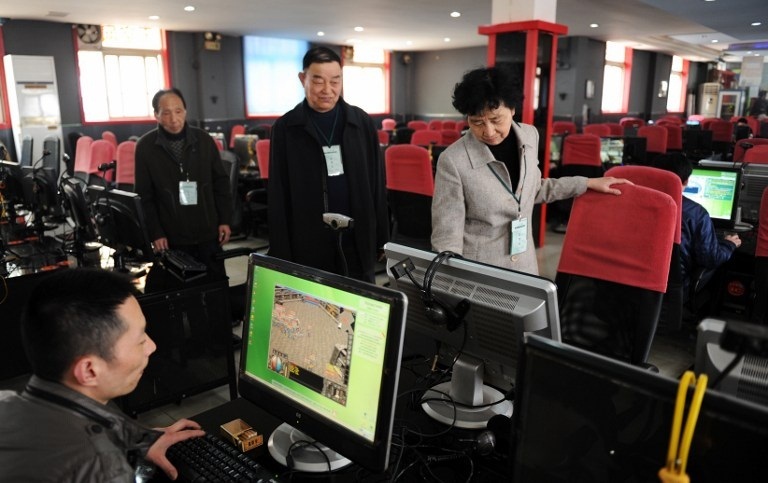 Chinese network management authorities check an internet cafe in a file photo. Authorities in China's northwestern region of Xinjiang have reportedly detained a man for using circumvention software to scale the complex system of blocks, filters, and human censorship known as the Great Firewall. Police in Xinjiang's Changji city detained a man this month for allegedly "downloading violent and terrorist circumvention software" on Oct. 13, according to a leaked crime report that circulated briefly on social media before being deleted, the Global Voice Online blog reported. "The leak raises serious questions about the consequences of using VPNs, web proxies, and other tools that help Internet users get around censorship and other obstacles (like slow speeds) in online networks," blog author and Internet activist Oiwan Lam wrote. "It has been estimated that 1-3 percent of China's internet users use a circumvention tool to visit overseas websites," Lam said. Citing copies of the report, Lam said the circumvention tool described in the report was a VPN (virtual private network), which enables users in China to get around the Great Firewall and visit banned websites. However, it was unclear exactly how a VPN, which provides no content of its own, could be classed as "terrorist and violent," Lam said. "This leaves Internet users with no way to know if their software or other tools are legal or not," she wrote. Last November, the New York Times reported that Xinjiang residents using overseas-based smartphone chat apps and VPNs had their services suspended by police. Users were told to report to a nearby police station to get their service restored, and warned that the suspensions were triggered by the use of a VPN. China has vowed to crack down on what it calls religious extremism in Xinjiang, and blames ethnic minority Uyghur "extremists" for a string of violent attacks and clashes in recent years. But critics say the authorities regularly conduct "strike hard” campaigns targeting the mostly Muslim ethnic group, including random, nighttime police raids on Uyghur households, a ban on children being brought up as Muslims, and curbs on the language, clothing, and personal appearance of the Uyghur people. Chinese authorities in Xinjiang routinely target men wearing beards and traditional robes and women wearing veils, while banning Uyghur families from taking their children to mosques. Dilxat Raxit, spokesman for the World Uyghur Congress exile group, said the authorities are very worried about the use of VPNs to get news not approved by the ruling Chinese Communist Party. "The authorities are terrified that [overseas] information will get out and start circulating, which they fear will turn people into potential terrorists," Raxit said. "The ongoing policies of curbs, surveillance, and suppression by the Chinese government is leading to something of a crisis for the regime," he said. "It has already got to the point of unsustainability." "I think that the Chinese government fears domestic opposition more than anything." Writing in Global Voices Online, Lam quoted former Xinjiang Communist Party chief Zhang Chunxian as saying that 90 percent of terrorism in the region was the result of jumping over the Great Firewall, where people become radicalized by overseas propaganda videos. Chinese online activist Xiucai Jianghu said there is no law against using circumvention software in China, however. "Even officials use this kind of software to climb the Great Firewall," he said. "If it's OK for them to do it, then it's OK for ordinary people to do, because we're equal, right?" "They basically say you have broken the law if they want to control you ... If they want to break the law, they break it." Online activist Jia Pin said that if the case means that VPNs are now on the list of terrorist equipment, then more and more people are likely to be accused of terrorism in future. "Ethnic tensions are very tense right now, and there are frequent acts of extreme opposition," Jia said. "But regardless of whether it's in Xinjiang or the rest of China, controls on freedom of expression are getting tighter and tighter."